Two busy North Texas freeways have new safety features to prevent deadly wrong-way collisions. The Texas Department of Transportation started installing high-tech sensors and signs in recent weeks after an NBC 5 Investigation that began in 2015 questioned why the state was not using the latest safety technology on DFW area roads. Over the last two years, NBC 5 Investigates revealed TxDOT had not made safety changes recommended by experts for at least a decade that are proven to reduce wrong-way crashes. Now, 24 Tarrant County ramps have new high-tech signs with flashing LED lights triggered by sensors that can spot cars going the wrong way. “First goal is to try to get their attention to alert the driver that they're going the wrong way,” said Val Lopez, TxDOT spokesman. Despite recent inclement weather, TxDOT crews have been out working to put a freeze on wrong-way drivers. When the sensors pick up a car going the wrong direction, they not only light up the signs, they also send a message to a TxDOT command center. From that command center, TxDOT can post messages on light-up message boards warning other drivers that there’s a car on the highway going the wrong way. TxDOT will also immediately alert police. The signs are part of a bigger plan to make more than 50 freeway ramps safer along two sections of Interstate 30 in Arlington and Fort Worth and one stretch of Texas Highway 360 from Trinity Boulevard to Pioneer Parkway. In addition to road sensors and flashing sings, TxDOT will install about 100 “DO NOT ENTER” and “WRONG WAY” signs that sit lower to the ground that normal signs, making them more visible in headlights at night -- and hopefully more obvious to impaired drivers. In 2015, an NBC 5 investigation questioned why TxDOT wasn’t using safety measures like lower signs on North Texas roads. 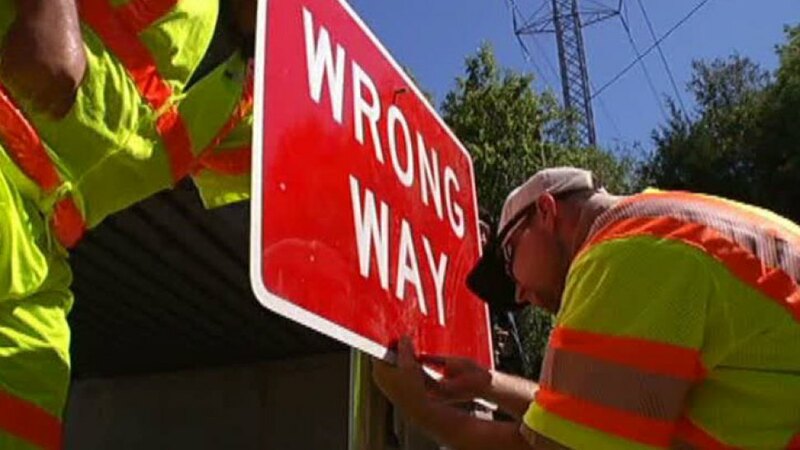 In California, signs set three feet above the ground have been credited with helping reduce wrong way crashes for decades. After the reports, TxDOT promised changes on some of the freeways where NBC 5 Investigates found numerous wrong-way crashes had occurred. Tommy and Donna Davila lost their daughter, Sabrina Fernandez, to a wrong-way driver on I-30 in 2014. “I’m pleased they’re finally doing something,” said Tommy Davila. The ramp where the wrong-way driver got on the highway is among the locations where TxDOT has installed a new high-tech sign. “I'm happy and then also sad in a way that it took this long to put up those flashing red lights,” said Donna Davila. The Davila’s want TxDOT to move faster to expand this effort to other North Texas counties. TxDOT said it plans to do that after testing the new signs in Tarrant County to see which ones work best. “This is not a case where we install these counter measures and we walk away. We will study how effective they are, which elements are most effective and use those in future projects,” said Lopez. In TxDOT's Dallas district officials said they also plan to begin installing red reflective markers on 115 exit ramps in Dallas County in February 2017. The reflectors show white to drivers going the correct way, and red to drivers going the wrong way. TxDOT eventually plans to install the markers on ramps throughout the Dallas district. Those changes might spare other families from devastating collisions that cost so many lives. “They need to continue doing this to help out everybody make our highways safer I hate to see other people go through what we've gone through,” said Tommy Davila. Many wrong-way drivers are intoxicated, but highway officials hope even some impaired drivers might notice the more visible signs. For years, Texas has led the nation in wrong-way crashes. New records from TxDOT show in 2016 alone, there were more than 1,000 wrong-way crashes on Texas roads resulting in 65 deaths. Dallas and Tarrant counties are among the four worst counties in the state where are you are more likely to be hit by someone going the wrong way. NBC 5 will continue following this issue into 2017.